Although there are a plethora of cases available for the iPod Touch and not just from Belkin, most of them generally cover the cool looking design of the iPod. But as we all know, nothing is more impressive than seeing the original design of the iPod Touch, unless you don't want to conform of course. Go Apple! 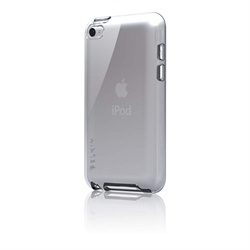 However this is where the Grip Vue for iPod Touch comes into play that is a clear translucent case that has this strange grip texture to it but also boasts a high-gloss finish. Belkin also note that the material does offer additional impact resistance, although I was not ready to try this out but knowing that it's there, is some peace of mind. The installation is easy as it's a form-fitting shape that slides over your iPod Touch. Thankfully you have access to all facets of your iPod from the camera to the buttons and of course the most important aspect the charging port/dock. With a slim design, it's almost like the Grip Vue doesn't even exist. With a 1 Year Warranty, this item rocks!